Hi Shimmerz Friendz! It's Julee Tilman popping in to share a shimmery card with you. My hubby's birthday is this week and in the mail he got a card from a company of which we're frequent customers. It was just a plain card with three brushstrokes of paint and a black and white sentiment, but it got the wheels in my head spinning. I headed up to my studio to try to do my own spin on it. I reached for Freshly Squeezed, Well Blue Me Down and Pink Stilettos, knowing that the pink stilettos would blend well with the other two colors if I used it as the middle swash of paint. I sprayed a bit of each color on my palette and then used a wide wet brush to make the blue and orange swashes, leaving room in between for the pink. When these were dry, I painted in the pink stilettos, overlapping the other two colors. I then set this aside and pulled out the Petite Poppies Stampz set. I wanted to stick to this same color palette, so chose the blue for the flower, orange for the center of the flower and then mixed the blue and orange together for the stem and leaf. Once everything was dry, I coated with a layer of Angel Wings Shimmerz for that shine we all love, then did a few accents with a white gel pen and fussy cut. The brick Scrapaholics chipboard piece is coated with gesso so that it would pick up the true color when I sprayed it with the pink stilettos. When the spray was dry, I pounced on Tidy Widy Texturez in random places to give some depth. 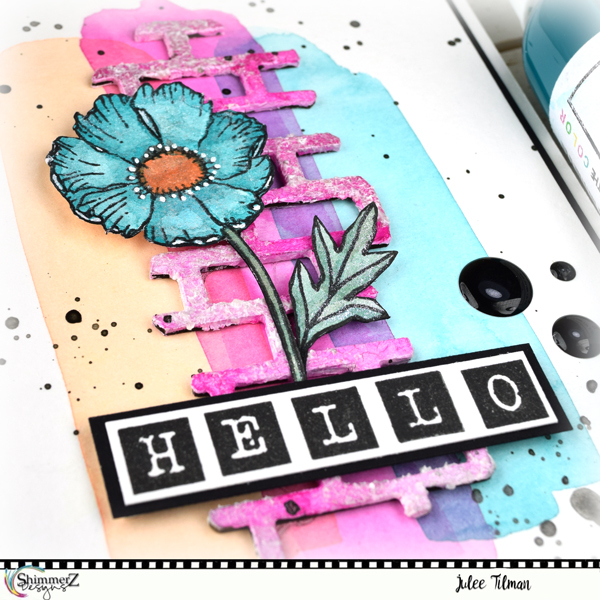 I used some alphabet stamps for the sentiment, then layered it all together and finished with some paint splatters with Burnished Buckle Inklingz. I hope this project inspires you to take a look at your sprays and experiment with how they'll blend together. The translucency of these sprays make them so fun to layer! Thanks so much for stopping by today! 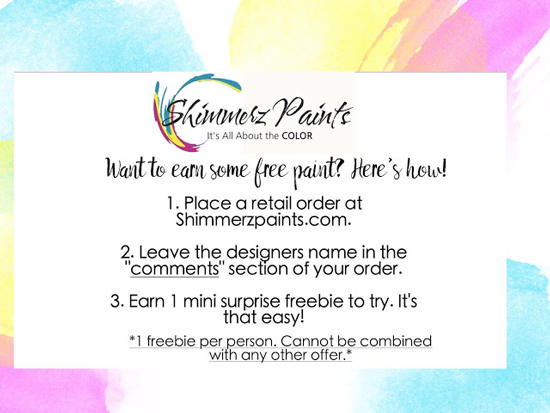 Don't forget, if you place an order in the Shimmerz Shop, be sure to mention my name (Julee Tilman) in the comment section when you place your order for a freebie!